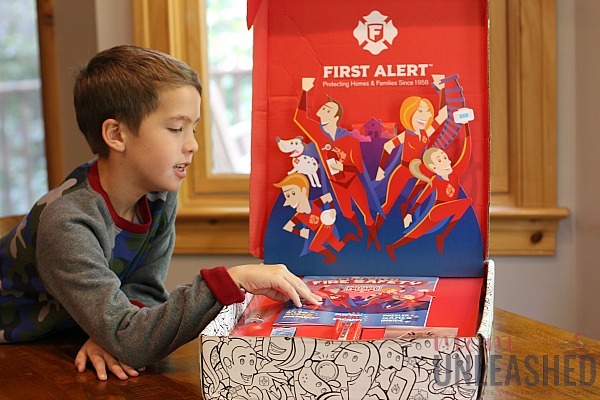 Thank you First Alert for sponsoring this post. October is Fire Prevention Month – practice safety in numbers to ensure your family’s super prepared too! On October 1st, 1993 my family’s condo burned to the ground. Thankfully we weren’t there but I’ll never forget the the tone of my mom’s voice as she told us that everything was gone. It’s one of those moments that’s seared into my brain and one that we discuss quite often. In fact, for years after that day I remember a shadow box that hung in our home with the burned nails (which were pretty much all that was left) and a picture of what once had been. Having myself experienced what fire takes from families, it’s always been important to me that I secure my home and keep my own boys from having the same memory. However, I’ll admit that over time I’ve gotten complacent and fallen into that mindset that fires only happen to other people (kinda crazy since it actually DID happen to me, right?). However, when I recently was reminded that October is Fire Prevention Month, it was like a light bulb switched on in my head and all those memories came flooding back. I decided right then and there that when it comes to fire safety and my family, there is no room for complacency. So, I made it my mission to give my oldest a refresher course and my youngest a simply yet effective lesson on fire safety. 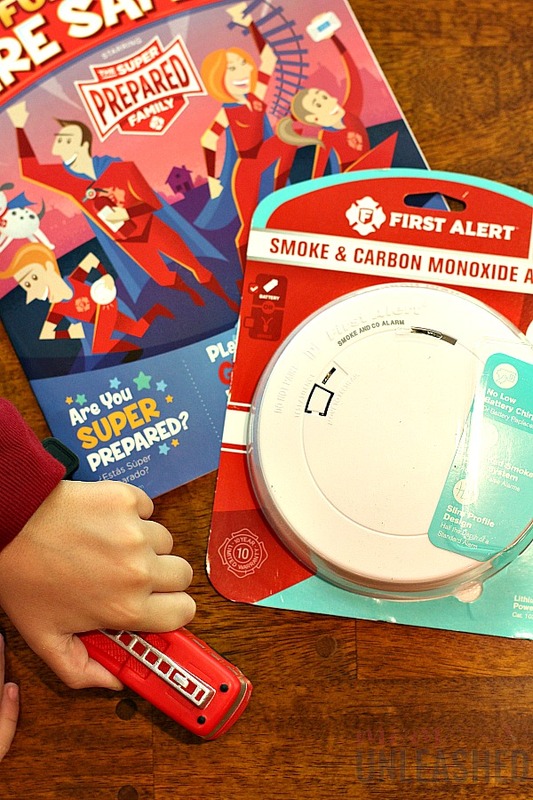 Since I’m a believer that every child should know about fire safety and that every family should be super prepared, I wanted to share with all of you how to teach kids about fire safety in three easy steps. I know it is all of our greatest hopes that a fire never robs us of the security of our home or even worse a loved one. And truthfully, I think that we can work towards that goal with a little preparation and a lot of team work. That’s why I encourage you to follow the three easy steps below in honor of Fire Prevention Month and not only talk to your kids about fire safety today but also take a minute to make sure your home is super prepared! I’ll be the first to admit that I was worried about discussing fire safety with my youngest because I didn’t want to scare him. However, after a little research I discovered that we can talk about fire safety as a family in a way that is age appropriate for him. He’s always been the type that is obsessed with fire trucks (you have no idea how many Halloween’s he’s been a fireman) so by sharing simple statistics with him like the fact that a fire department responds to fire every 24 seconds I was able to capture his interest. Of course that statistic led to questions about why there are so many fires to which I was able to respond that over 100 million homes in the US are not protected with smoke alarms and that 3 out of every 5 home fire deaths are the result of a home having no working smoke alarms. I was even able to expand on this and share with him that fire alarms provide early warming if a fire happens and that since fires spread quickly, every second counts when you’re trying to stay safe! Now, if you have kids you know where he went with this immediately, asking “Do our fire alarms work mama?”. Of course I nodded, grabbed the hubs (fire safety is a family affair after all) and moved on to step 2 of my fire safety lesson. 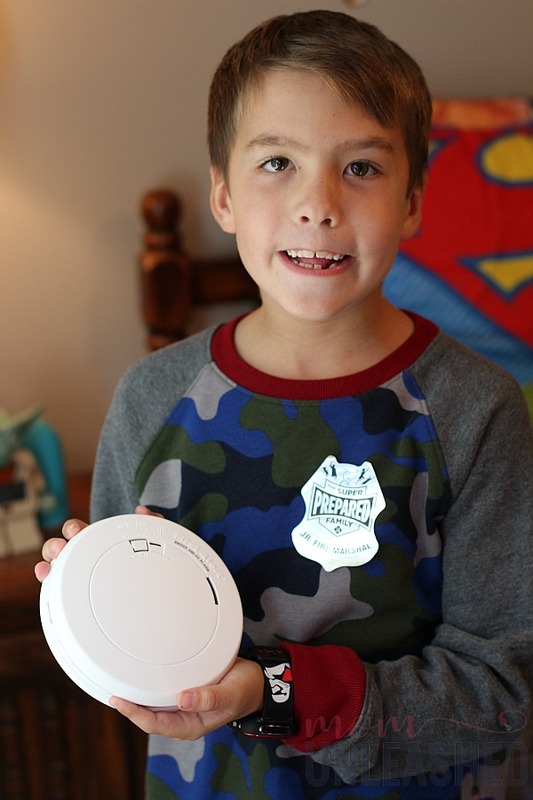 Since we had already established the importance of fire alarms, we decided to get the kids involved in checking all of ours and making sure that they were up to date. I had recently learned that alarms don’t last forever and need to be replaced every 5 to 10 years (depending on the model) and since our home is ten years old this year, I figured we needed to do a little fire alarm updating. I’m gonna be truthful here and say that without this recent lesson, I would probably just have gone on along my happy way thinking that my fire alarms were all good and not knowing that I needed to change out these very important devices in my home that provide early warming if there is a fire. 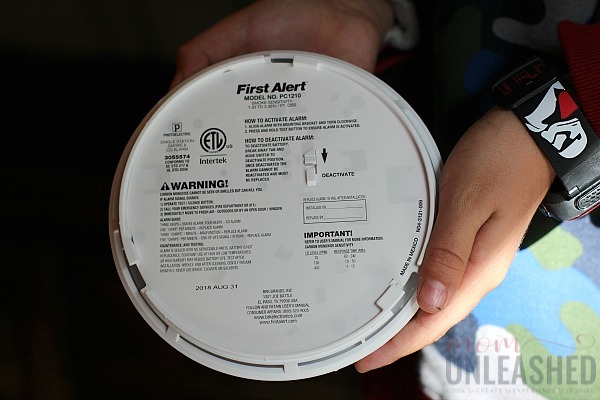 But, since I now know what I know, I grabbed the fam and we went to work changing out our old fire alarms and replacing them with First Alert’s 10-year sealed battery alarms. 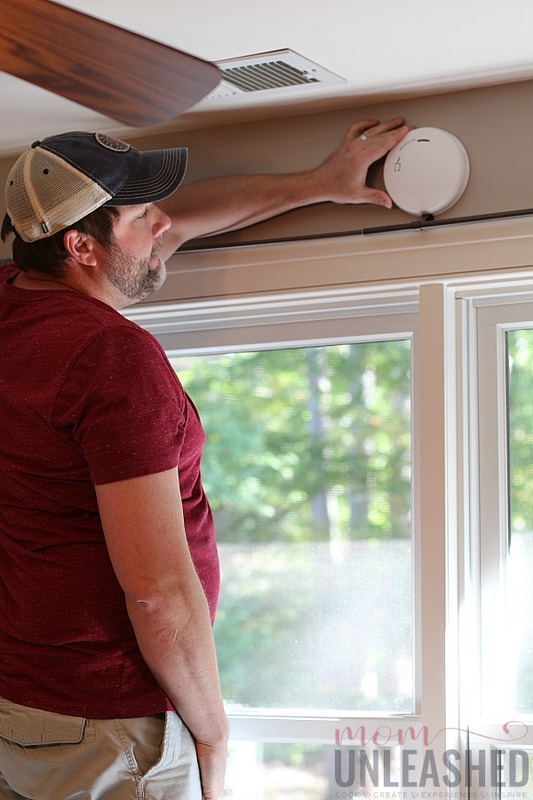 These easy to install fire alarms eliminate the need to replace batteries (it’s recommended that you test alarms regularly and replace the batteries every 6 months for regular fire alarms) and give my family the peace of mind that in the event of a fire, we’ll be super prepared. In addition to their longevity, they also provide carbon monoxide detection (reminder: Carbon Dioxide is invisible, tasteless and odorless and can be produced from any fuel burning device) meaning that I can rest easy even with having gas appliances in my home knowing that I’ve go the best protection to warm me early of fires OR carbon monoxide! 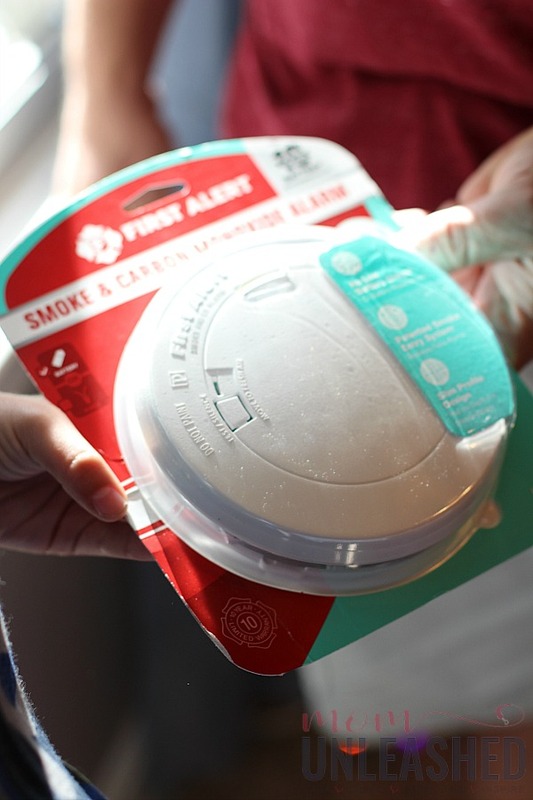 Once we had installed our new fire alarms on every floor (even in the basement) and inside and outside of all bedrooms, we were ready to move on to the final step in our fire safety lesson. While our two previous steps had hopefully ensured that our home and family are protected from fires, the final step in teaching kids fire safety is to make a plan of what to do in case a fire does occur. Trust me when I say practice and knowing exactly what to do in the case of a fire is key to getting everyone out safely. So talk about what your family should do if there ever is a fire. Make an escape plan and ensure that everyone in the family knows how to get out of the house safely and where to meet. If you have younger kids like I do, make the route as simple as possible and find ways to make it practicing fun. You can even plan simple rewards for practice runs that are successful! Remember that teaching your entire family what to do in case of a fire in a calm and effective way can make a big difference! Are you ready to make sure your family is super prepared in case of a fire? For more resources on how to keep your home safe, be sure to click here. Then grab your kids and watch the video below to start the conversation on fire safety in your own home. Then, remember that fires can happen to anyone at any time. Make sure your family is super prepared through education, practice and of course checking your fire alarms to keep everyone safe! There are just so many things I have not THOUGHT ABOUT when it comes to being a parent! Gah! Not going to lie, last night I couldn’t sleep because I was thinking about feeding my son. HA! And not knowing if I will be any good at even doing that! I have never sat down and discussed fire safety with my kids and it can be devastating if it hits you. I need to get these alarms they are so convenient and well worth it. Thanks for sharing your tips. I have to check this site out. Fire safety and having a plan is so important. I’d add a fourth step and that is PRACTICE. My neighbor had done everything right except practice the plan. Everyone was fine, but it was a harrowing moment or two. I practice with my dogs and they know where to go, too! This is SO important. We have so many wildfires around here that are started for dumb reasons (like smokers, kids playing with fireworks, unattended campfires, etc.) Unfortunately my family’s ranch is caught in a big fire that’s raged here for multiple weeks, but it was lightning caused. Still, we could prevent so many of them if we just taught people how to be safe, and why they should. I like that this way isn’t scary for kids. I was traumatized in 1st grade by a fire safety lesson and it still haunts me as an adult. I like this a lot better. This is so important for kids to learn. 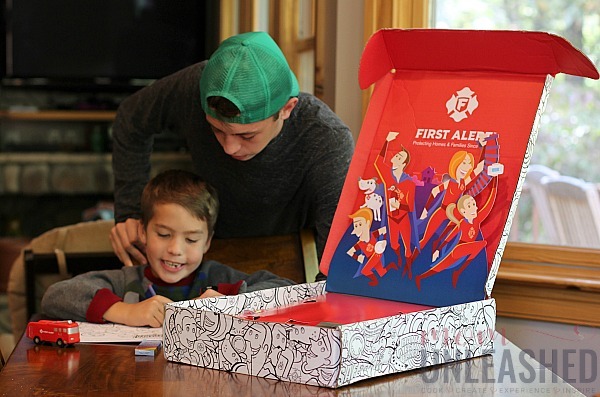 When my kids were younger we sat down and made emergency plans and would review them every so often to remind the kids what to do. I feel like teaching fire safety to our kids when they’re young has gotten so much better and interactive. It’s really going to help people have that knowledge of what to do in case they ever need it. My daughter knows all these tips and it is never late to teach your kids at young ages. It does save a life and does not take long to learn. As kids absorb everything. Fire safety is such an important thing to teach kids at any age. This post will be very helpful for anyone with kids needing to learn the basics. Thanks for sharing this. Fire safety is so important. We don’t have a plan, but will after this! How scary to have your house burn down! We have those same smoke detectors, and I love that they don’t end up chirping in the middle of the night due to low battery (why do the batteries ALWAYS die during the night?). We also try to practice getting out of the house, having a specific place to meet up, and remembering to stay low, etc. Thanks for the reminder that it’s time to go through that again with the kids! It is so important to talk with our kids about fire safety. They need to be informed and to be prepared to it, to know what to do in case it happends! We had a family in our neighborhood die when I was a kid and I always remember my parents being vigilant in teaching my siblings and I about fire safety. It’s something I have shared with my kids should a fire occur in our home. So good to cover this ground. As a mom, there are so many things that we worry about when it comes to keeping our children safe. Knowing they understand and have a basic understanding of what to do in dangerous situations makes sleeping at night that much easier. Thanks for sharing. These are great tips. I am glad that I came across this post because I think it is time to change out our alarms. This was a good reminder! 1stopmom recently posted..We Made Our Own Almond Milk Thanks To Vitamix!